A flat foot is one that has less space under the medial longitundinal arch than normal. 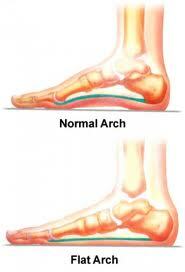 Lowering of the arch is a normal part of walking which allows the foot to absorb shock from the ground; however excessive or prolonged lowering may lead to foot problems. Different muscles and ligaments may become stretched or over worked, while others may be hardly used at all. As well, when the foot is in a pronated (flattened) position it is more flexible and floppy which can allow bones to shift. How can a Chiropodist help? A Chiropodist will do an extensive biomechanical and gait analysis to examine flat feet. They can prescribe custom foot orthotics, give advice on shoes that are appropriate for people with flat feet, perform physical therapy to treat any muscle/ ligament strain, implement a stretching/ strengthening regimen to help restore balance to the muscles in the feet, and treat any skin lesions secondary to the flat feet such as corns/ callus. The information provided is intended for educational purposes only. It is not a substitute for a proper medical evaluation. Treatment options will vary from person to person.